It’s a pleasure to share our project experience on integrating C4C with AWS DynamoDB via CPI. Amazon DynamoDB is a nonrelational database, you can create database tables that can store and retrieve any amount of data. However it does not have an endpoint url. The key aspect of this integration is the authentication mechanism which is a bit different from other integrations. AWS expects the authentication signature in a specific format, namely combination of authorization & header parameters. 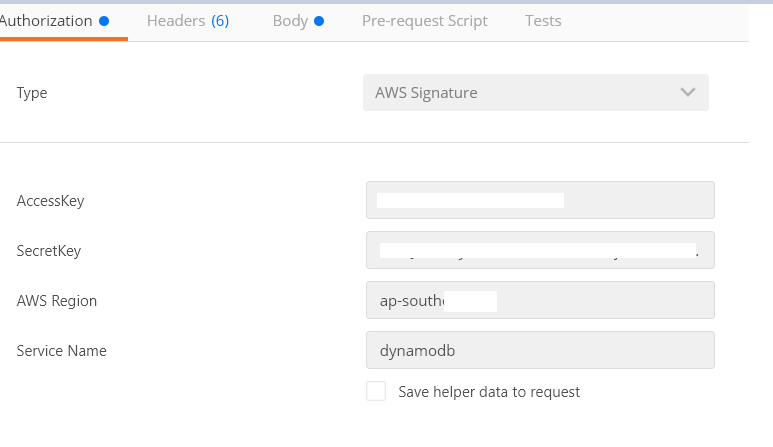 With this blog, we wanted to share the steps that are needed to push data from C4C to DynamoDB table. Push data from C4C to CPI. This is a pdi development wherein on save of an Activity, we are sending Activity related information to CPI in json format. In CPI, we are converting this payload into XML via standard JSON-XML convertor. 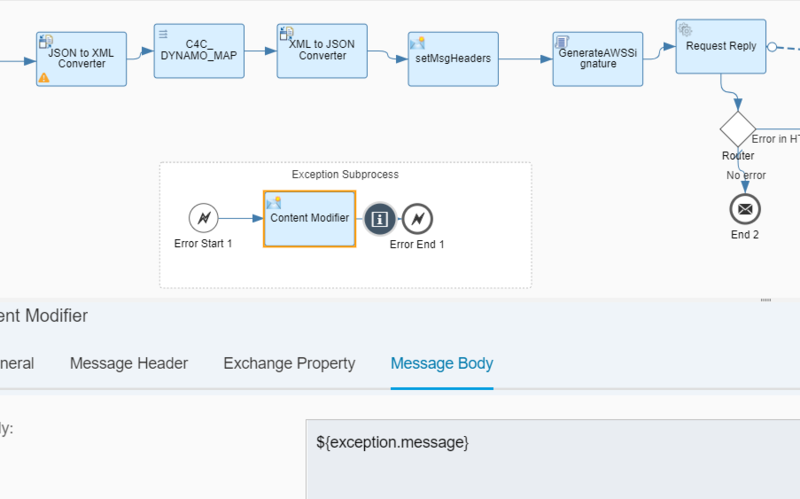 Convert the Message Mapping output from XML to JSON via JSON convertor because DynamoDB can accept incoming request in json format. Signature Version 4 is the process to add authentication information to AWS requests sent by HTTP. Requests to AWS must be signed with an access key, which consists of an access key ID and secret access key. These two keys are commonly referred to as your security credentials. We referred to the below links to create the signature. The generated signature should match with the one that’s dynamically created by AWS at runtime. // POST requests use a content type header. For DynamoDB, the content is JSON. // Request parameters for Create/Update new item--passed in a JSON block. // Read AWS access key from security artifacts. // Step 1 is to define the verb (GET, POST, etc.) --already done. // parameters are passed in the body of the request and the query string is blank. // and lowercase, and sorted in code point order from low to high. Note that there is a trailing \n. // in the canonical_headers list, delimited with ";" and in alpha order. // hash of the request. "Host" and "x-amz-date" are always required. // For DynamoDB, content-type and x-amz-target are also required. // Step 6: Create payload hash. In this example, the payload (body of the request) contains the request parameters. // Create the signing key using the function defined above. // Put the signature information in a header named Authorization. // noted earlier. Order here is not significant. The response from DynamoDB sent back to C4C in the form of status code. Ex:Code 200 means success, 400 means Bad Request. 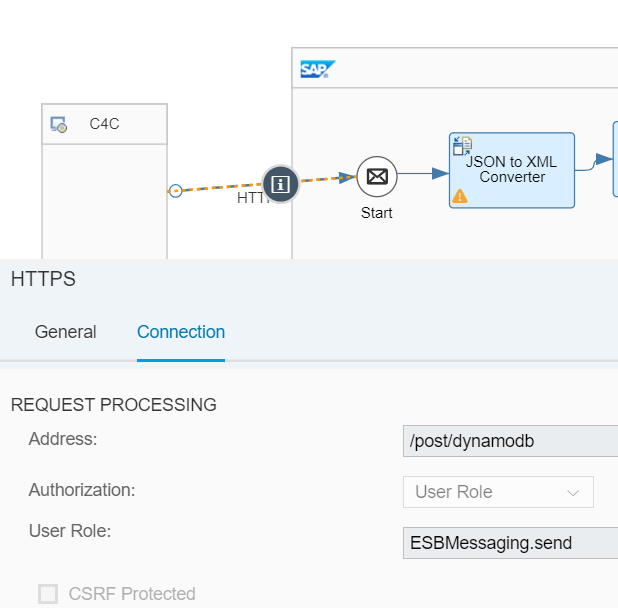 We learnt what it takes to set up the integration between C4C and DynamoDB via CPI.